"Fairytale. That is the expression I would use if I had to describe the character of my violas with just one word. If a whole sentence was allowed I would say: My violas sound full, dark and soft, with a tone that carrys well." 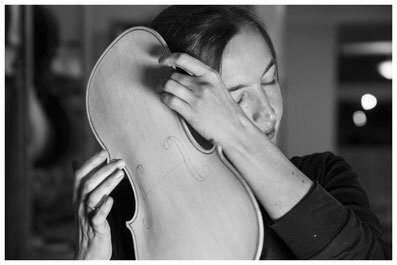 Because Barbara Gschaider loves to play the viola herself, she is familiar with all the common questions concerning size and stringlength: Other than violin and cello the viola varies in bodysize and stringlength. The viola made by Andrea Guarneri in 1676 is an excellent model. Our copys of that viola always sound wonderful - strong, but soft through all positions. 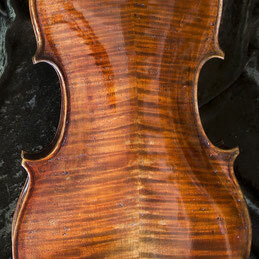 We also love a viola made by Giovanni Paolo Maggini. According to the extremely high and full arching copys of this viola sound nice and dark. However, the original (right) outline with its short middle bouts is for some musicians difficult to play, so we combine the Maggini arching with the outline of the Andrea Guarneri. Only 35,5 cm in combination with a body length of 41,6 cm. Barbara Gschaider: "I really do love that model! A full sound like a big viola, but easy to play like the small models. Perfect, if you do have, like me, short fingers but long arms." As we could not find any model around 40 cm giving us proper results we shortened the wonderful Andrea Guarneri Model by 3 % in length but left the original width. We combine that outline either with the original arching for a clear and strong sound. Or we use the full Maggini arching giving us a dark tone. 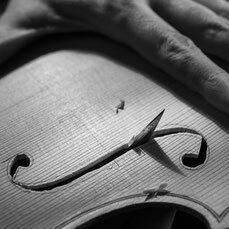 If you look for an even smaller size we offer you a viola based on a model of Gasparo da Salo (body size 39,5 cm) The arching is full and high like the Maggini, what gives even that small size viola a great sound. 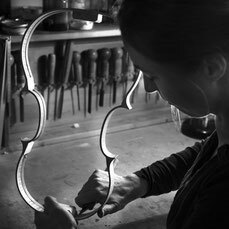 The swinging string length of all small sized violas is 36 cm.